Since Sean only had one more day to see all that Shanghai had to offer with me, I was hell-bent to make sure he saw the best. In my opinion, this involved Xiao long bao from Shanghai’s most famous restaurant. Turns out it also involved a guy in a Yankees jacket. Check out the full story below! The first day of the conference was only for a select number of people, so the rest of us were left to our own devices, which meant: sightseeing and exploring Shanghai (or for some of the ladies in our group, more back-alley shopping for handbags and purses). 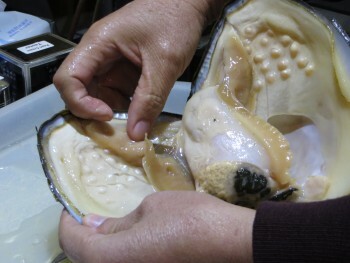 The owner of Fenghui Pearls showing us how freshwater pearls are grown and harvested. Sean and I decided to go back to Yuyuan Garden but stick to the main thoroughfares, and our friend David decided to join us. As we were all marveling over the expense of a giant piece of wild grown ginger root, a little Chinese man wearing a Yankees jacket opposite us piped in and told us in wonderful English that it cost so much because finding and harvesting wild ginger is incredibly labor intensive. He described the process, which involves jade picks and up to two weeks of painstaking labor to remove a root from the ground intact, then asked if we were shopping for anything in particular… Next thing I knew, he was whisking us through the winding streets up to his pearl and jade shop: Fenghui Pearl, teaching us how the freshwater pearls are formed and harvested and inviting us to look around his shop. One hour, five cups of tea, and several back and forth bargains later, David emerged with multiple presents for his family and I came out with a beautiful grey, single pearl necklace and matching earrings for a bargain price. Not too shabby. 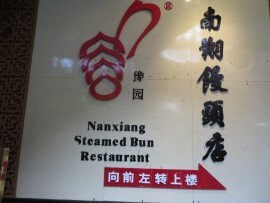 The world renowned Nanxiang Steamed Buns restaurant in Shanghai. Best xiao long bao in the city. 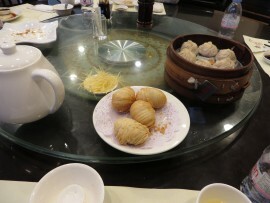 A small portion of the delicious dumplings and xiao long bao that made up our sumptuous lunch. We were famished by this time, and Adam and Soo met us just in time to eat at the most famous steamed dumpling shop in all of Shanghai: Nanxiang Steamed Bread Shop – home to arguably the best Xiao long bao in Shanghai. I insisted on this – the place is world-famous, and no one was disappointed in the end. We had delicious steamed dumplings filled with pork, shrimp, and beef plus these flaky crab puffs and sautéed green beans with garlic. I gave my tongue and the roof of my mouth some pretty good burns in the process, but the taste made it so worth it. One more quick round of shopping inside one of the many buildings lining the street, a tour of People’s Square and the surrounding parks, and we were on our way back to the hotel to prepare for the second night’s event: a river cruise on the Bund. The second night of the conference, before it began in earnest the following day, all attendees were invited to attend a river cruise on the Bund; the river that cuts through the center of Shanghai and offers amazing views of the tallest towers in Shanghai, colonial architecture preserved from Victorian times and the general dazzling lights of the city at night. Fantastic – there’s nothing else to say except the views were captivating and it couldn’t have been a more fun activity. Everyone who went had a great time. 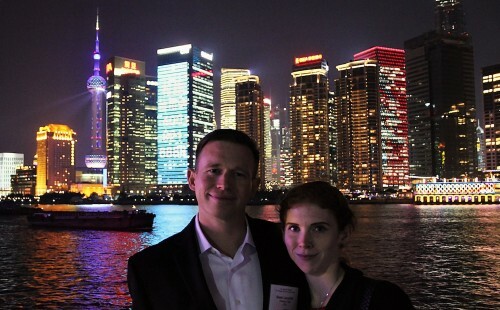 Sean and I in front of the Shanghai skyline on the Bund river cruise. Photo courtesy of: Soo Jones-Kelley. For the next couple of days, I was on my own during the day while the conference went on, so I took the opportunity to re-acquaint myself with Shanghai in full. I hopped in a number of cabs to see sights like the Jade Buddha Temple (where I saw monks pray and chant in the temple while I was there), the Bund (which I saw on one of Shanghai’s rare beautiful days with full sunshine and blue skies), the Dongmei Pedestrian Walkway (where I bargained for silk scarves), and Xin Tian Di (where I saw some sort of British documentary team filming as I strolled by). I also spent a good deal of time just walking around Shanghai taking it all in, which is my favorite way to experience a city. 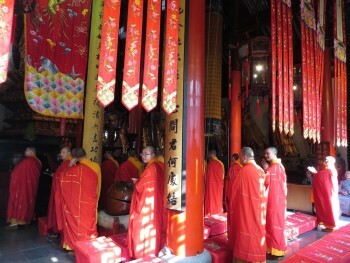 The monks in residence at the Jade Buddha temple in Shanghai praying and chanting. In no time at all, it was the final night of the conference, the team was exhausted but pleased that everything went off so well, and it was time for the true vacation-phase of the trip (and the part I was most looking forward to): Hong Kong, Hong Kong, Hong Kong!!! This entry was posted in Asia, China and tagged Asia, Bund, China, Hong Kong, Jade, Nanxiang, Pearl, Shanghai, Temple, Travels, Xiao long bao, Xin Tian Di, Yuyuan on July 7, 2014 by Paige N..